BENIN CITY — NO fewer than 7,000 persons with different ailments from several communities in Etsako West, Etsako East and Etsako Central Local Government Areas of Edo have received free treatment provided by a United Kingdom based Medical Doctor, Benedict Ifsuokor. The medical outreach which lasted three days had over 50 medical personnel from across Nigeria and the UK also collaborated with the Edo State Action on AIDS, SACA, to counsel people with HIV/AIDS. personnel from across Nigeria and the UK also collaborated with the Edo State Action on AIDS, SACA, to counsel people with HIV/AIDS. Ifsuokor who said the death of his parents due to none access to proper medical services prompted the outreach, which put the cost of the three days free treatment at over N20m. According to him, “I was around in March to bury my mother and i was alarmed with the appalling state of this hospital when i visited, i then took a decision to do something for the community. “My father died in this community and the message I got back in England, was that he died in this appalling condition, the services of this hospital were not enough to meet with his condition as at that time. “My mother died before me in England and before she died, she begged me to come and meet with her people back home in Nigeria. “I called the resident doctor to ask about the specific services that she will need, but all these were not available.” All these moved me into what you are seeing here today. “I was moved with passion to come into this community to provide these services that are essential and to prevent needless deaths in the community. “I came in with six medical personnel from the UK, joined by 15 from Lagos and Abuja, another 10 from hospitals in Benin and another six from University of Benin Teaching Hospital, UBTH.” “I also came here with two state of the art patient monitor, a diagnostic test, and other medical equipment.” “There is also a provision for a solar generator which is actually on transit as we speak. I Bought it for £10,000, excluding shipment. It will be assembled here in this hospital. “I have spent over N17m, excluding the cost of the generator. All the cost is fully on me, no assistance from anywhere. 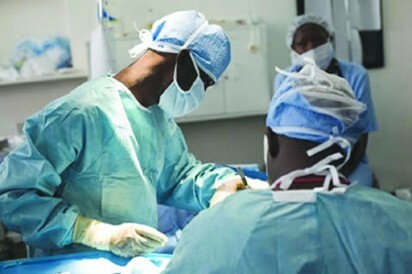 Ifsuokor who said he has the plan to sustain the free medical treatment, noted that any patient with extreme case,would be referred to a Specialise Hospital in Benin for proper treatment.